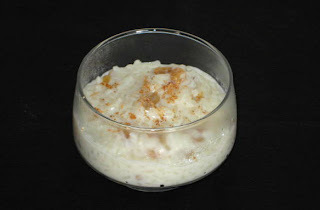 This must be one of the easiest economical desserts that I now make on irregular basis. Anytime I have leftover rice from main meal and I don’t feel like doing a stir fry this recipe comes in handy. And yes, it is one of Marjo’s favorite. 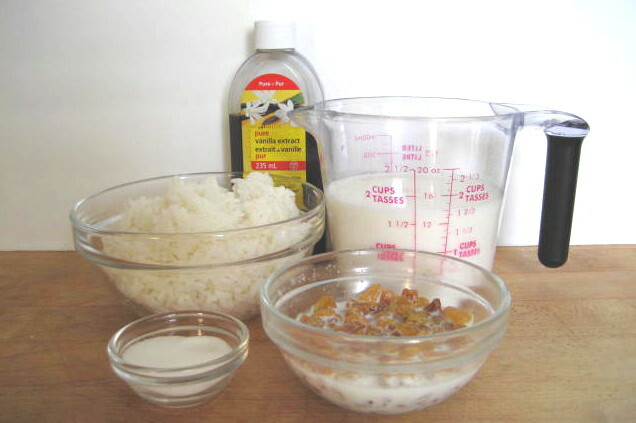 Soak raisins in 1/2 cup of milk for 1/2 hour before starting to heat up milk. Combine rice and 1-1/2 cups milk, sugar and salt in heavy saucepan. Mix well with whisk till sugar is dissolved and there are no lumps in the rice. When milk comes to simmer add remaining milk with raisins and bring back to simmer. Cook over low to medium heat for about 10 – 15 minutes. Stir occasionally until thick and creamy. Add vanilla and almond extract into rice mixture. Cook 2 minutes longer, stirring occasionally. Ladle into serving dishes and sprinkle with nutmeg or cinnamon. Can be served warm, room temperature or cold. Note: I use only 2 tsp. of sugar because golden raisins I am using will give off quite a bit of sweetness to the pudding. Replace the almond extract with lemon zest and juice, and you have Mexican rice pudding. Great stuff... it's been my father's specialty ever since we lived in Mexico when I was a little kid. Next time I'll make it I will omit sugar all together and replace it with local Amish Maple syrup and as you sugested almond extract with lemon zest and juice. Thanks for tip!